This is one of those “few handful” recipes. It’s really lovely way to enjoy afghan biscuits without all the sugar. Plus they’re gluten free! Definitely kid-friendly – lots of healthy nuts – and they also enjoy collaborating on the build! Pulse hazelnuts in food processor until fine. Add cocoa powder, two heaped teaspoons peanut butter, vanilla, and a few brazil nuts, walnuts and raisins. Blend. Add a couple of teaspoons of syrup (if desired) or more raisins to sweeten. Blend. Once doughy, remove from food processor and add to bowl. Mix in cornflakes by hand. Roll into balls. Enjoy! Particularly nice with spiced chai rooibos (red bush) tea. Recently I found some vegan chocolate & hazelnut spread, so I decided to make pancakes to put it on, then Jessie informed me that the spread was too sugary for the blog, so these pancakes don’t have the spread. Mix together the flour, baking powder, egg replacer (or banana), water, vanilla essence, and cinnamon. Depending on how you like your pancakes will determine how much water you add. 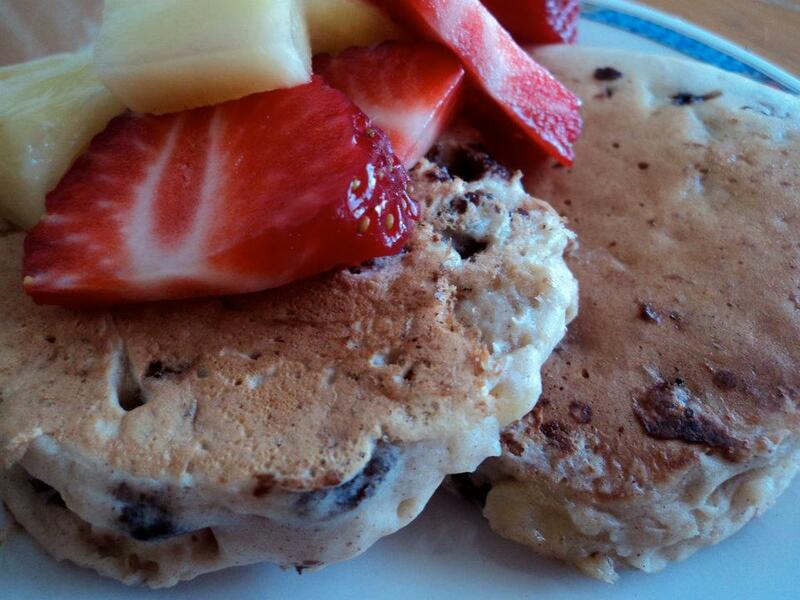 2 cups of water will produce thick pancakes, whereas adding 3 cups allows you to make thin pancakes. Melt a knob of margarine in a flat bottomed frying pan on medium heat. Pour in enough batter to cover the base of the frying pan (depending on how thick you like your pancakes) – if you want really thin pancakes, use the edge of a spatula to spread out the batter – and fry until the bubbles on the top start to pop. Flip the pancake over and cook for a similar amount of time. Remove from pan, put on a plate in the oven, and repeat until you’re out of batter. You want to add a small amount of marg to the pan before each pancake. Note: If you don’t have margarine, don’t try replace it with oil. This will result in the pancakes being rubbery and not very nice. 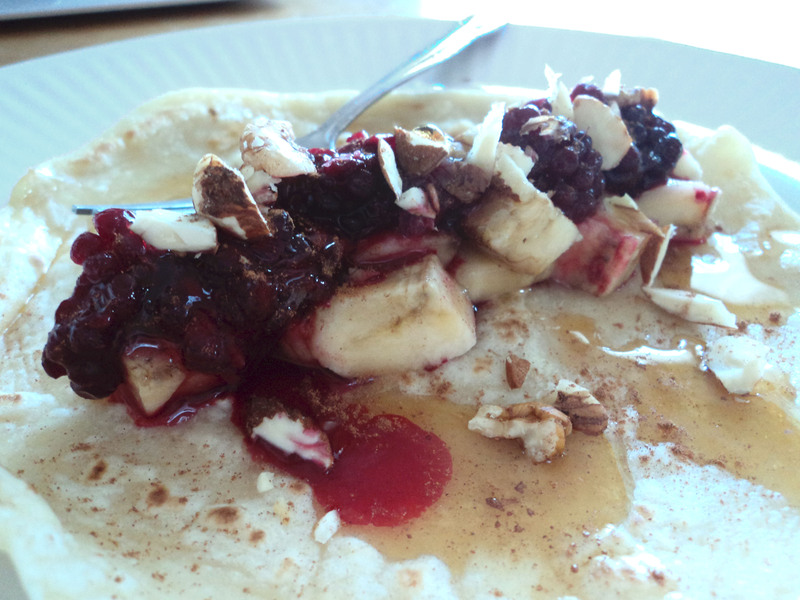 Cover the pancakes in berries, nuts, banana and drizzle some agave over the top. If you have some chocolate hazelnut spread like me, add that too, but if Jessie asks, you didn’t read that here! 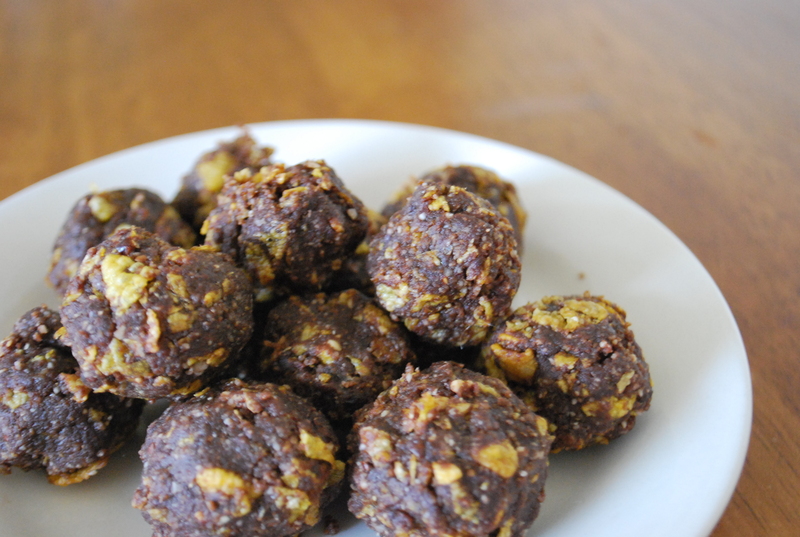 This, is exactly what I want out of raw food. When I eat it, my stomach is light, it digests perfectly and there is no sugar rush. It is rich, spongey and nostalgic. It tastes exactly like the kind of cake I’m not allowed. You must try it. It’s so quick to make! You can see I’m very proud of this one. Blissful gratitude in the form of monetary donations will be warmly accepted. Mash dates into a syrup*, mix with banana, sprinkle in cocoa, vanilla and then mix in the almond meal until you form a cakey texture. Press into molds and put in the fridge. While that refrigerates, mash up the other soaked date into a paste, add coconut oil, nut butter, cocoa powder and vanilla – whip into chocolate sauce. Those two aspects will keep in the fridge until you are ready to serve. Then when ready to assemble place chopped frozen banana in the food processor, with a little vanilla and a little water to aid blending. When consistency is similar to soft-serve icecream, throw in a few raisins. 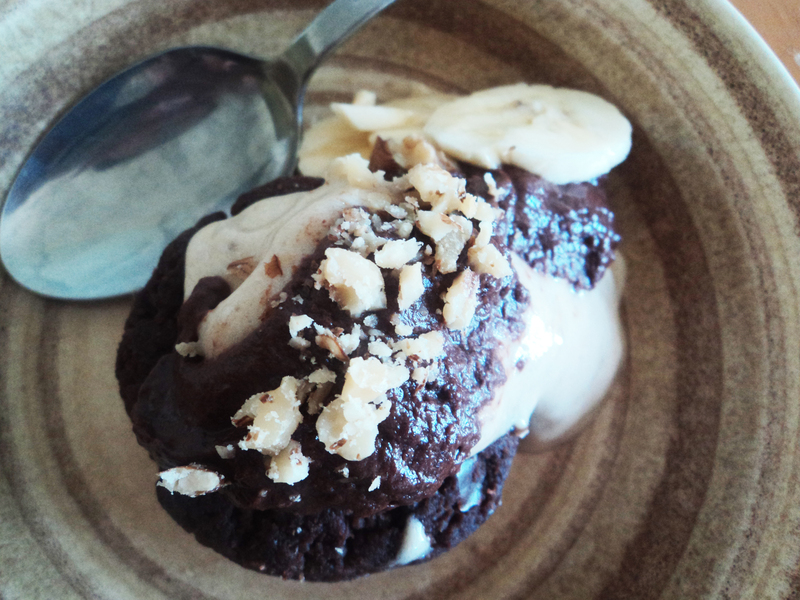 Assemble by dropping icecream onto the cake, topping with chocolate sauce and crushed walnuts. Serve immediately. These gooey, inexpensive, quick pancakes will make everyone happy.